Councillor Henry Reilly took to social media to ask Sinn Fein whether they had any comment to make in relation to the banner asking ‘Willie F wers ur daddy’ (sic) in a reference to the IRA murder of Bertie Frazer, a UDR soldier. Sinn Fein, who regularly glorify the murderous deeds of the IRA, did not respond to Councillor Reilly. 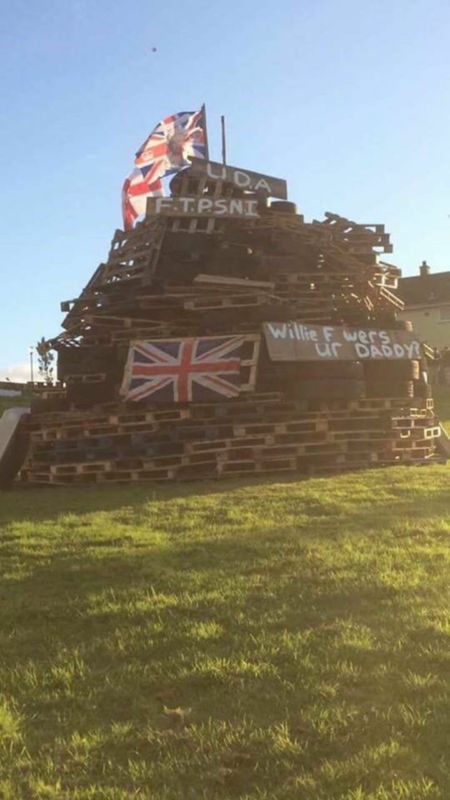 The offensive hate crime on this Nationalist bonfire is the latest in a long line of abuse directed towards the Frazer family. 56 Responses to "Nationalist ‘internment’ bonfire mocks murdered UDR Soldier "
Greetings from Idaho! I’m bored to death at work so I decided to browse your site on my iphone during lunch break. I enjoy the info you present here and can’t wait to take a look when I get home. I’m surprised at how quick your blog loaded on my cell phone .. I’m not even using WIFI, just 3G .. Anyways, wonderful blog! I want to show some thanks to the writer for rescuing me from such a situation. Just after surfing around throughout the world wide web and meeting suggestions which are not pleasant, I was thinking my life was done. Being alive without the approaches to the difficulties you’ve resolved all through your good posting is a crucial case, as well as the kind which could have negatively affected my entire career if I had not encountered the blog. Your actual knowledge and kindness in playing with every item was very helpful. I am not sure what I would’ve done if I had not come upon such a solution like this. It’s possible to at this point relish my future. Thanks for your time very much for this professional and effective guide. I will not be reluctant to endorse your blog to any person who should have assistance on this problem. obviously like your web-site but you need to take a look at the spelling on quite a few of your posts. Several of them are rife with spelling issues and I to find it very troublesome to tell the truth nevertheless I’ll surely come back again. Youre so cool! I dont suppose Ive read anything like this before. So nice to search out anyone with some unique ideas on this subject. realy thanks for starting this up. this website is one thing that’s wanted on the net, someone with a bit originality. helpful job for bringing something new to the internet! Throughout this great design of things you secure an A+ just for effort and hard work. Where exactly you actually confused me was first on the particulars. As it is said, the devil is in the details… And it couldn’t be more accurate right here. Having said that, allow me reveal to you what did deliver the results. Your writing can be very engaging which is most likely why I am making an effort in order to opine. I do not make it a regular habit of doing that. 2nd, despite the fact that I can easily see a leaps in reason you come up with, I am not necessarily confident of how you appear to unite the points which inturn produce the conclusion. For now I will yield to your issue but trust in the near future you link the dots better. I and my pals were actually following the nice tips and tricks from the blog and then then got a terrible feeling I had not expressed respect to you for those tips. Most of the young men appeared to be as a consequence passionate to learn all of them and have in actuality been taking pleasure in these things. Thanks for turning out to be well accommodating and for getting certain extraordinary areas millions of individuals are really desperate to be informed on. Our honest apologies for not expressing gratitude to earlier. Thanks – Enjoyed this article, how can I make is so that I receive an email when you write a new article? Really Appreciate this article, can I set it up so I receive an email sent to me when you make a new article? I was suggested this blog via my cousin. I am no longer certain whether this publish is written by him as nobody else recognise such specified approximately my problem. You are amazing! Thanks! Pretty part of content. I just stumbled upon your blog and in accession capital to claim that I get in fact loved account your weblog posts. Any way I’ll be subscribing on your augment or even I success you access consistently fast. I read through the right products below. Unquestionably amount book-marking pertaining to returning to. I personally amaze simply how much attempt you add to produce this sort of magnificent beneficial website aplikasi berita saham indonesia. obviously like your web-site however you have to take a look at the spelling on several of your posts. Many of them are rife with spelling issues and I find it very troublesome to inform the reality then again I’ll definitely come again again. hello!,I really like your writing so so much! share we be in contact more approximately your post on AOL? I need a specialist in this house to solve my problem. Maybe that is you! Looking forward to look you. I’d should verify with you here. Which is not something I normally do! I take pleasure in studying a publish that will make individuals think. Additionally, thanks for allowing me to comment! I like the valuable information you supply for your articles. I will bookmark your blog and take a look at once more here regularly. I’m rather sure I will learn a lot of new stuff right here! Good luck for the next! Appreciating the persistence you put into your blog and in depth information you provide. It’s nice to come across a blog every once in a while that isn’t the same outdated rehashed material. Excellent read! I’ve bookmarked your site and I’m adding your RSS feeds to my Google account. Hi I am so thrilled I found your webpage, I really found you by accident, while I was looking on Digg for something else, Anyhow I am here now and would just like to say thank you for a remarkable post and a all round enjoyable blog (I also love the theme/design), I don’t have time to look over it all at the minute but I have bookmarked it and also added in your RSS feeds, so when I have time I will be back to read more, Please do keep up the fantastic work. you know any techniques to help reduce content from being stolen? I’d really appreciate it. Its like you learn my thoughts! You appear to grasp so much about this, like you wrote the book in it or something. I believe that you just could do with some percent to power the message home a bit, but instead of that, this is excellent blog. A fantastic read. I’ll definitely be back. hey there and thank you for your info – I’ve definitely picked up anything new from right here. I did alternatively experience several technical issues using this website, as I experienced to reload the website many instances prior to I may just get it to load correctly. I have been thinking about in case your web host is OK? Not that I am complaining, but sluggish loading instances times will very frequently impact your placement in google and could damage your high-quality rating if ads and ***********|advertising|advertising|advertising and *********** with Adwords. Anyway I’m including this RSS to my email and can glance out for a lot more of your respective exciting content. Ensure that you replace this once more very soon..